How to Treat Your Skin to Some Holiday TLC - Doctor Hermann M.D.,P.A. The holiday season is officially upon us, which means that the next month will fly by in a flurry of gifts, parties, and delicious meals. Take some time this winter to splurge on yourself as well by giving your skin some extra TLC. The following cosmetic and spa treatments can transform your complexion, revive your skin, and help you welcome 2018 while looking like it’s 2010! A facial is the perfect way to supplement your at-home skincare regimen because it is meant to exfoliate and nourish your skin. Regular exfoliation and nourishment prevent signs of aging from accumulating on your face and dulling your appearance. Since facials can be customized to meet your exact needs, you will get the results you want! 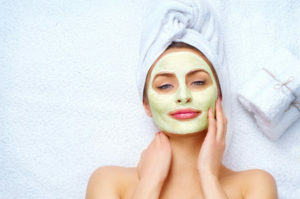 A Classic Facial, for instance, utilizes exfoliation, steam, pore cleansing, extractions, and a massage in order to address concerns such as skin congestion, sensitivity, and loss of firmness. Other specialized facial options include the Vitamin C facial, the Organic Tropical Facial, and the Pre-Teen Facial. Chemical peels address unwanted signs of age and damage on your skin differently than facials. Chemical peels use specific chemicals like lactic acid to shed the top layer of skin and trigger the body’s natural response of growing newer, healthier skin in its place. Peels are available in light, medium, and deep variations depending on your desired outcome and commitment to recovery time. The Lightening Lift Peel, for instance, uses lactic acid with a blend of brightening agents in order to reduce sun spots, brown spots, and the redness caused by rosacea. Microdermabrasion is possibly the most powerful addition to your monthly skincare routine. This treatment removes the topmost layer of skin with a diamond tip wand. As the skin is exfoliated, a vacuum removes dead skin cells to leave the outer layer of skin looking and feeling smoother and healthier. This process also promotes the growth of younger, more vibrant skin cells. Overall, microdermabrasion can diminish the appearance of scars, facial spots, and wrinkles while helping your entire complexion look brighter. Hermann Wellness is the best place to go in the Tampa and St. Petersburg areas for these skincare treatments and so many more. Dr. Hermann and her team offer superior cosmetic treatments that are tailored to your exact needs. Call (813) 902-9559 to schedule your first appointment and enjoy something special for yourself this holiday season!